Several years ago my friend Gil suggested that comics could never truly claim to have arrived until Roger Langridge is a big star. People feel that strongly about the cartoonist behind Hotel Fred, Knuckles the Malevolent Nun, Fred the Clown and Art d'Ecco (with brother Andrew) among others. At one early Small Press Expo I was approached by a pack of artists at a party in the hopes I might know what he looked like and could signal them if he showed up, something that's only happened to me with one other artist (Eddie Campbell) at one other show (a San Diego con). Langridge's work is clean, vibrant, beautiful to look at as a series of cohesive units and possessed of a wonderful, classic-comics take on character design and comedic timing. The cartoonist's struggle to find his deserved audience in several different comics market may be the oddest proof of his comics' timelessness. Hopefully, as his career continues to build from multiple companies and in multiple avenues, more and more readers will make the same discovery a few readers and several fellow pros already have: Roger Langridge is a great and largely undiscovered treasure. 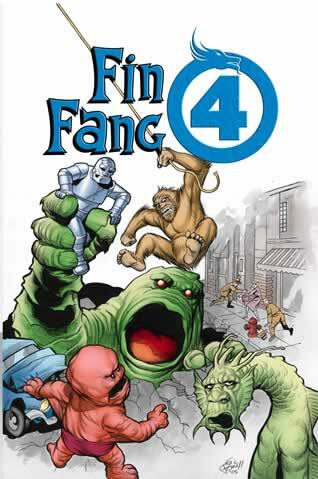 This Wednesday sees the latest chance for folks to discover Roger Langridge in a reasonably high-profile side project: a take on Marvel's monster and the transitional early-superheroes period with Scott Gray called Fin Fang Four. Next month Langridge will have an 11-page story in a Marvel holiday special teaming with Shaenon Garrity and featuring a plot assist by Andrew Farago, who performed the following interview back in April. In addition to providing this site with the occasional high-quality interview, Farago is the Gallery Manager/Curator of the Cartoon Art Museum. FARAGO: This is the Tuesday following the Alternative Press Expo. What were your impressions of the Alternative Press Expo 2005? LANGRIDGE: I had fun, which is not the most important thing -- covering my costs is the most important thing, which I didn't do -- but it was a good time. [laughs] I'm trying to think of something interesting to say... no, I can't. FARAGO: I don't know how many American conventions you've done at this point, but did this stand out as being any different than SPX or Comic-Con? LANGRIDGE: I made less money, I guess. [laughs] It's a similar sort of crowd to SPX, as far as exhibitors go. I think that the audience is perhaps younger, perhaps less interested in a wide variety of things. They're more interested in something that brands itself as alternative. I think that's possibly what they're looking for, something that's deliberately got a sort of underground aesthetic. LANGRIDGE: After my years in the wilderness. FARAGO: After a long absence. 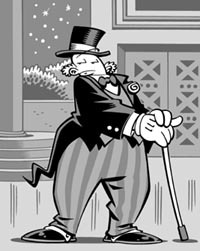 What's that experience like, being affiliated with a certain company, back with Fantagraphics after ten to fifteen years? LANGRIDGE: It's really good to have some sort of working relationship with a publisher where you can be reasonably sure that if you do something good it will be published. Obviously it takes a great load off my shoulders because, as a self-publisher, all the publicity and the expense of publishing and all that falls on your shoulders. It's really good to know that I don't have to worry about that right now, particularly with a two-year-old and all the expense and the expenditure of time that being the dad of a two-year-old entails. It means that I've been earning less, so self-publishing hasn't been an option. So, yes, good to have some sort of home for my work. And I'm glad it's Fantagraphics, too, because we do have that history, and I'm reasonably sure that they're sympathetic and that I know where I stand with them. FARAGO: Working backward a little bit, how did you come to the attention of Fantagraphics in the first place? This would have been back around 1990, with Art d'Ecco. LANGRIDGE: A little bit earlier than that. With my brother Andrew, I'd done about three minicomic versions of Art d'Ecco. That was in 1988. I sent the first two of those to Fantagraphics and quite a few other people, trying to find a proper publisher for them. Fantagraphics weren't the only ones that answered, but they were the only ones that answered and actually made an offer. I think I sent them to Eclipse and whoever else was around at the time... I can't remember, but that level of publishing house. FARAGO: Dark Horse was probably just starting out at that time. FARAGO: So were they looking for the next Love and Rockets, you think? LANGRIDGE: I don't know. I'm not quite sure what their strategy was. I know that they were putting out an awful lot of stuff, and most of it has sunk without trace. And this was before they started their Eros line. So I think maybe it was just financial desperation, you know, they were just hoping for a hit. But in any case it was a foot in the door that I wouldn't have had otherwise, and it did lead to other things, so from my point of view it was a really good opportunity. The right thing at the right time, as far as my career was concerned. LANGRIDGE: Certainly, at that time, they had star artists. Peter Bagge was probably their biggest star, along with the Hernandez brothers, at the time. And Daniel Clowes -- I think Eightball had just sort of started. FARAGO: You mentioned your brother. Is that how you got into the minicomics scene? LANGRIDGE: It wasn't a scene, so much. In New Zealand, there is no comic industry. The people who do comics publish them themselves, pretty much. There were a couple of anthologies. There was one that started in the '70s called Strips. I think the last issue came out about the time that I was getting my minicomics out for the first time. I did try and get into that, but the last issue never came out, so the one thing that I did for them never appeared. There was another anthology called Jesus on a Stick, published by Chris Knox, who is probably better known as a musician. For many years he had a band called Tall Dwarfs. He's actually done quite a lot of touring in America and Europe and so forth; he is sort of known outside of New Zealand. But as well as being a musician he's a cartoonist, and he's had a regular weekly strip in one of the major national newspapers for many years. He published this anthology basically with his music buddies, most of whom happened to be cartoonists in their spare time. So there was that, and then there was another one called Razor. It was started up by Dylan Horrocks and a guy called Cornelius Stone. By the time I came along, it was pretty much Cornelius' baby entirely. I think Dylan, by that point... he hadn't quite left for England, but he was about to, so he had other fish to fry. As well as publishing my own minicomics, I realized that it would be useful for me to be published just about anywhere else. So I was, at the time, trying to get into any anthology I could get into, publishing my own stuff, and trying to get into the university newspaper and just have as much stuff in print as I could. I had this kind of strategy worked out that I would go to England in a couple of years -- save up enough money to buy a plane ticket and live for six months or however long when I arrived, because England had a comic industry and New Zealand didn't. I wanted to have a reasonably big portfolio of stuff before I went. Razor was one of the places that I decided I would crack. That actually led to a very strong and long-lasting friendship, which lasts to this day, with Cornelius, who ended up being my collaborator on Knuckles the Malevolent Nun. I was doing that at about the same time as I was doing Art d'Ecco as a minicomic. It was '89 when it became a regular ongoing strip in the university newspaper. And that was pretty much the scene at the time: a couple of anthologies, a few minicomics, and the university newspapers. LANGRIDGE: Because I had decided when I was six years old that I was going to be a cartoonist, I never had any aspiration to go to university, but my parents, who had spent quite a lot of money on my education, had other ideas. There was a bit of a row when it was time for me to decide what I was going to do with the rest of my life, after I left school. They wanted me to be a lawyer, and I wanted to be a cartoonist and study art, or just, you know, get some experience. The compromise we came to was that I would get a degree, any degree, they didn't really care what, and once I'd done that my life was my own. And I'd have something to fall back on if it all went pear-shaped. So I went to university. I got a Bachelor of Arts degree, which was the easiest thing I could think of, and studied English for a few years, and then got the first menial crappy job I could find while I worked doing my cartoons at night and saved money to come to England. To run away to the circus. FARAGO: How long have you been in England? LANGRIDGE: I first arrived in 1990. I sort of struggled for a few months and then started to get paying work. I stayed there for a year, until about September 1991. Then I went back to New Zealand, thinking, "I've cracked it now! I can work from home!" It didn't work out that way, and after a couple of years of really struggling to make ends meet, I sort of threw the towel in and accepted that I had to live in England full-time. Either England or America, and England was the one that I could work in legally. [laughs] So that was that. I came over for good at that point. FARAGO: Was it during your university days that you met Cornelius Stone and Dylan Horrocks? LANGRIDGE: Yes. Actually, it was my final year at university, 1988, because that was the year I started to get stuff into the university newspaper, and when I really started to get serious, I think, about making this a career. I mean, I always had this idea in the back of my mind, but I think that was the point at which I just pushed everything else aside and decided to go for it. I knew Dylan and Cornelius both by sight, because we frequented the same comic shops and what-have-you. Cornelius was the one who was publishing Razor at the time, so he was the one I approached. I later found out that Dylan had grown up in the same neighborhood as I had, just up the road, pretty much. Cornelius gave me some of his scripts, because he was writing an awful lot of stuff at the time. He was a bit of a phenomenon at the time, actually, because he was not only holding down a full-time job, but he was publishing this magazine, he was working as the art director on the university newspaper, he pretty much didn't sleep. And writing pages and pages and pages of stuff, just a colossal amount of work. FARAGO: Knuckles the Malevolent Nun -- is that a joint creation, or strictly Cornelius, or your visual? How did that come about? LANGRIDGE: It started off as an ending to a longer story featuring Tisco George, which is a character of Dylan's. We did a thing in Razor called the Tisco Jam, and we had a whole bunch of artists, everybody we could think of, contribute a page or several pages. As it turned out, because I was hungry for the work, and because I was always available whenever Cornelius asked, I ended up doing probably about half of it. We had a sort of epilogue to the Tisco Jam where this character, Knuckles, who Cornelius had come up with... he came up with the name and sort of a vague description, that she was a dwarf nun... this character, Knuckles, was really pissed off that she'd been left out of the story, and decided to take revenge on the cartoonists. That was sort of a two-page epilogue to the story. FARAGO: Are you joint copyright holders of the character? LANGRIDGE: Yeah, and any money we've made off any collections or any work on the character, we've always split fifty-fifty, and always will. Cornelius was kind of a mentor to me at one time, and I really feel like I owe him a lot. FARAGO: I can see the character catching on, but in a lot of ways, it's like a formula for the most unappealing character that you can come up with. [Roger laughs] It must be the right combination of so many horrible elements to suddenly come up with an almost likeable, in a horrible sort of way, character. LANGRIDGE: She's kind of admirable in that she's pretty much entirely without hypocrisy. Not entirely. I mean, she is a hypocrite about certain things, like she hates drug addicts but she's practically an alcoholic. But more fundamentally, it's basically this visceral character with a really strong visual, so people respond to it initially on that level. And then there's all this other stuff, because of Cornelius' really eclectic range of interests, that gets thrown into the strip and adds all these different layers to it. There is something for you if you're not interested in just that pure sort of puerile "poos and wees" comedy. LANGRIDGE: I'm trying to remember that one. LANGRIDGE: That's right, yes, yes. LANGRIDGE: This is my panic phase of the Hotel Fred continuity at the moment. I'm sort of in the middle of that. I started the strip with all these different plot threads and all these big ambitions, and I've sort of lost the plot, as it were, halfway through. And ran out of time as well. I ran out of time to do it properly, due to illustration commitments and what-have-you. So, yeah, I started doing kind of a stream-of-consciousness, ex-continuity thing, basically because that was the easiest way to fill the page every week. I suppose part of that was trying to engage my work by going back. Every so often I do this, not just in the Hotel Fred strip but in just about everything I do. I try and sort of go back to where I went off the rails, trying to figure out if there was another path I should have or could have taken. I suppose when I use old characters in that sort of way, that's part of what I'm doing. FARAGO: I was reading through it today, and at the start it seemed like, "Oh, this is obviously a murder mystery, and it's got these supernatural elements, and it's obviously going this way." The fun of it, for me, anyway, is trying to figure out where exactly the master plan was abandoned [Roger laughs] and you either got bored with the main story or thought of some completely unrelated element that you wanted to drag kicking and screaming into the story. It's a lot of fun, and visually it's been all over the place, as far as the styles that you're using and experimenting with. LANGRIDGE: After Fred the Clown, a lot of people told me, including Gary Groth, that the next thing I should do should be something longform. I thought I would try that in the webstrip, and see if it was working, and if it was, then perhaps tighten that up for print publication at some point. What I'm finding is that I'm kind of learning the hard way what not to do. In a way, it's worth doing, because I know what mistakes to avoid when I actually tackle something long next time. At the moment, yeah, it's a learning experience. But the webstrip has always been kind of a notebook for me. It's always been a place to dump ideas so that I can sift through them later and figure out what I'm going to print. It's almost too much pressure to have subscribers paying to see it, because the luxury of it for me is that people have low expectations of it, so I can just try stuff out and nobody really cares. That's sort of where I am with it at the moment. I do intend to finish the Hotel Fred continuity, and I've got the plot worked out. I do understand that it needs some sort of closure, I can't just leave it hanging forever, but that's not going to happen until I have time to actually write it out properly and make sure that I've got everything covered before I even start drawing it. I don't want to start this half-improvised thing I've been doing again, and lose my way again. I don't think it would be fair to the readers, either. FARAGO: Do you feel that the Internet, and particularly the Modern Tales exposure, has been very beneficial to your career? LANGRIDGE: I don't know if it helps my career, exactly. I think it's probably got me some more readers, people who wouldn't have stumbled across my website otherwise. And it's certainly been beneficial for me personally, in that there's been this kind of community of people. I've got to meet a lot of them as friends, which is great. LANGRIDGE: I found a place to stay in San Francisco, of course. [laughs] So from that point of view, just from the community point of view, I'm really glad I got involved in it. I kind of feel like I'm not entirely in sympathy with the idea that webcomics ought to be paid for. I joined up [with Modern Tales] because I was invited and I was flattered to be invited, basically, and I was flattered to be in the same company as a lot of these people. But I've been having second thoughts for a long time about whether or not it's actually right for me to ask people to pay for the self-indulgent stuff that I'm throwing at them. So I may reconsider my position once Hotel Fred is finished. But I want to get that finished before I make any decisions on that score. FARAGO: Speaking of community, what's the community like as a cartoonist living and working in London? LANGRIDGE: There are a lot of cartoonists living in London who you would have heard of, but the ones I hang around with tend to be ones you won't have. FARAGO: If you want to name names, and this gets published anywhere, this'll be their moment in the sun. LANGRIDGE: There's a guy called Mark Stafford who is possibly one of the best cartoonists I've ever met. He's actually doing something now with Bryan Talbot, so I think his days of obscurity are numbered. But for years, for about the decade that I've known him, he's had this phenomenal sketchbook and absolutely stunning portfolio that he's carried around and shown to everybody, and pretty much done nothing with. He's got a really good sense of humor and writes really funny stuff, and nobody's ever seen it. There are a lot of people like that. There's a guy called Faz Choudhury who helped me on Gross Point at one point. He's got a style which he's consciously modeled on Yves Chaland, and he's done some really terrific stuff. I think this is common in a lot of British creators, I'm not singling these people out, but there's just not a lot of motivation. I don't know if that's just the climate or the culture, but people just can't be bothered. FARAGO: Is 2000 AD the top of the heap? LANGRIDGE: It's the top of the commercial heap, certainly, although I think it sells less than Eightball these days. It's really not anywhere near the force that it used be, when just everybody read it. But, yes, obviously, for many years, that was far and away the most interesting thing coming out of Britain, as far as comics were concerned. FARAGO: Have you tried getting into... you'll have to correct me on which ones are still around and which ones aren't, but I suppose there's the British Viz, not to be confused with the company over here, and is Beano a separate magazine? LANGRIDGE: [laughs] No, Viz is more of a parody of the Beano and the Dandy and those kinds of children's comics. For a while in Britain, [Viz] was, I think, the fifth-highest-selling magazine in the country, never mind comic. It was just this phenomenon in the early '90s. But I think it reached that status because people considered it to be a parody of a comic rather than a comic. Although, technically, it was a comic, in that it had panels and it told stories in comic form, adults could buy it without embarrassment because it wasn't "really" a comic. FARAGO: It's one of those things that's completely impenetrable unless you're from England. [Roger laughs] I spent time over there, and I try to soak up as much of the culture as I can, and I watch my Monty Python and try to do my bit, and I just can't make heads or tails of those magazines. LANGRIDGE: Yeah. It's not just satirizing British social mores, it's also a very particular kind of... I mean, they do a lot of parodies of tabloid newspapers, and unless you actually read the tabloid newspapers -- and although they're extremely popular, a lot of people just avoid them, myself included -- then you're not going to get half the references that are going on. If you don't really keep up on popular culture, it's not going to mean a lot to you. But, yeah, even now it's still got a following, although it's selling nowhere near where it used to. It's still selling far better than any other comic in the country, that's for sure, still sort of in the 100,000s or something. FARAGO: Better than any American comic magazine. With your work on various projects like Doctor Who, your illustrations, at least, are probably widely known to people who may not know your name. LANGRIDGE: Probably the most widely-seen thing I do is that I've got an illustration gig for a magazine called Inside Soap, which is sort of a gossip rag about Coronation Street and EastEnders and all those soap operas. I do a caricature thing every week for them. I don't know what the numbers that they sell are, but I think it's in the hundreds of thousands. But, yeah, not a single one of them will know my name. Doctor Who magazine is much more of a cult thing, but it's much the same sort of deal. I do a caricature once a month for them -- the Doctor and the Assistant of the month, fighting some monster or something. I've done some comic strips for them as well, on a few occasions. They sort of call me up every couple of years and throw me a bone. I did actually do something for Viz once, a long time ago, but they rejected it because it was too well-drawn. They commissioned it, they paid me for it and everything, but then they got somebody else to trace over the artwork and make it look like crap. So, yeah, not exactly a career highlight. FARAGO: It's sort of a backhanded compliment, I guess. "Too good for the likes of us." LANGRIDGE: That was actually the phrase I was told by the editor who commissioned it, that it was too good. I'll take my compliments where I can find them. FARAGO: We've all heard worse. So I guess that's just part of being a cartoonist and an illustrator, that your drawings are going to be more famous than you. LANGRIDGE: I guess so, if anybody actually remembers them. I mean, it's a pretty ephemeral thing, being a weekly magazine about series that lose characters so fast that if you look at them a year later you won't recognize anyone. But I haven't even been doing it that long. In fact, it's only been about six months, so I can tell you in a few years whether people are remembering it or not. I don't know at the moment. FARAGO: Someone doesn't have it anymore. LANGRIDGE: Fantagraphics have still got copies, but someone else further down the chain doesn't. That's what I know. LANGRIDGE: [laughs] Fred the Clown didn't fly. FARAGO: Do you feel you're reaching a significantly wider audience, now that it's distributed by Fantagraphics in this very nice packaging in bookstores across the country? LANGRIDGE: Well, we're in bookstores, for a start, which is something that I could never have done on my own. And Fantagraphics have got enough clout as a name, as a publisher, for people to sort of trust their judgment a lot of the time. If they're a bit unsure, if they're sitting on the fence, the Fantagraphics name might push them over the edge, rather than me being a grotty little self-publisher. And they've got the publicity machine to get it out to reviewers and things as well, while I don't have the knowledge or the energy to pursue that vigorously. So, yeah, for lots of reasons, it's a good place to be. 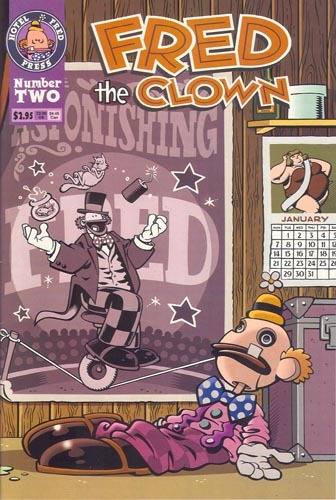 FARAGO: Things like the history of Fred the Clown... Reading it, I'm someone who deals with cartoon history as a profession, and it's been a passion of mine since I was a young child. I was always interested in finding out the secret past, and who the artists were behind these comics, and what the deal is with these comics that are a hundred years older than I am. Do you expect this to reach a large portion of your readership, or will it go over the heads of most people? LANGRIDGE: I think probably most of the jokes will go over the heads of most of them, yes, but hopefully the fact that it is a humorous text, and I'm making a lot of jokes that don't require knowledge of comic history -- hopefully people are going to get it on that level, if they can't get that level of clever-clever, comic-based jokes. I'm always quite conscientious, or at least I try to be, of making my work as accessible as I can. I kind of think that's part of my job, that even when I'm putting in references to things that only me and five other people are going to get, there should at least be another joke in that panel that everybody's going to get. Because otherwise, I'm just not connecting with anybody. FARAGO: So you'll follow the history with a nice custard-pie gag. LANGRIDGE: The authorial voice in that article, I tried to make as funny as possible, just making snide remarks about the people he's talking about all the time. People could at least get it on that level, even if they don't know what he's talking about. FARAGO: In addition to what's in the book, there's quite a lot of other Fred the Clown material in the world. The material archived on Modern Tales isn't necessarily in here. LANGRIDGE: There's a bit of overlap. But like I was saying earlier, I kind of think of the webstrip as a place to try things out, and if they work I'll commit them to print. It's sort of a place to try them out where nobody's going to get hurt. Nobody's going to be forced to shell out for something that isn't very good. In a way, it freed me up a lot, because it gave me the confidence to try things, knowing that I wasn't risking anything by publishing a dog. I wasn't going to end up publishing anything that hadn't been road-tested, if you like. FARAGO: I've heard writers and artists say that it's difficult, sometimes, to write a character that's significantly more intelligent than they are. Like if they're writing a Fantastic Four comic and they have to have Reed Richards explaining some incredibly complicated scientific thing, and they want it to sound plausible, they find that difficult. But Fred the Clown obviously has a much lower level of intelligence. [Roger laughs] Do you find that also difficult, that there's too much of an intelligence dropoff? Is there anything you do to get in the Fred mindset when you're writing the character? LANGRIDGE: Suppository, expository. No, there's no expository text to speak of, so you're not going to get into his head at all. I never really thought about his intelligence much, except that there wasn't a lot of it. It's not something that's the main focus of the story as far as I'm concerned. It's more about his emotional state, or possibly what others think of him. FARAGO: He's a very primal character. "Primal force" might be a little too strong a label, but he's an emotion-based character. LANGRIDGE: Yes, I suppose so. He's not an analytical character, that's for sure. FARAGO: Among other things, Fred seems like a love letter to old black-and-white films and slapstick comedies. Are these influences that you had from an early age, or are they things that you discovered later on? LANGRIDGE: Comedy was something I've liked as long as I can remember. It started off being television comedy, and radio comedy came a little bit later. The old films came later still -- that's something I pretty much discovered as an adult. Buster Keaton and W.C. Fields and the Marx Brothers and all those things... probably late adolescence was the first time I really saw those and appreciated them. But comedy generally has always been my rock and roll. The other kids were into pop bands at school, and I was into The Two Ronnies and The Goon Show, all this comedy stuff. They were the albums that I played over and over again. That influenced the direction I took as a cartoonist, as well. I always knew that trying to be funny was something I wanted to do. FARAGO: Were you much of an entertainer yourself? Did you do any of this for friends and family? LANGRIDGE: I'm told that I was quite extroverted as a very, very small child, but by the time I was at school for a couple of years that had pretty much been beaten out of me. With close friends I could be reasonably entertaining, but it wasn't something that I would do for the whole school. We've talked a little bit about some of the older comedians. Spike Milligan and The Goon Show in particular were big influences. LANGRIDGE: Yes. I got into those around the age of thirteen, fourteen, really heavily. I'd always liked Spike because he'd written this children's book called Bad Jelly the Witch, which, in New Zealand, to this day, is played every other Sunday on the radio. They have a time set aside for children's programs on Sunday mornings. That was my absolute favorite children's story. It was funny and very imaginative. He'd do the characters' voices -- I mean it was Spike reading the story himself on the record, and he'd do the characters' voices like W.C. Fields and Jimmy Durante and all these things. I had no idea who they were at the time, but that was part of the fascination. As time went on and I started to discover these things and realized that these were references to an earlier generation of comics, that became part of the fascination as well. The Goons, I was aware of for a long time, but I didn't really get into them until I was about thirteen or fourteen, which was probably when I was at my most miserable at school, and when I needed some kind of escape the most. At the time, in New Zealand, it was being played, I think, every Sunday night at 9:00. I would tape them and just play the tapes back over and over and over again. Although it's probably remembered these days by people who only know the show on a kind of surface level, for its catchphrases, which it had loads of, what really gripped my imagination was the way Milligan used misapplied logic and absurdism and elements of surrealism, and this kind of Warner Brothers cartoon manic energy, and revolutionary use of sound effects, to create these absolutely impossible mental pictures. There was a lot of misdirection with the sound effects, you know, he'd have somebody saying, "Well, I'm going to go over here now," and then have footsteps walking away, often for an extremely long time, so that it would be funny, and then it would stop being funny, and then it would keep going, and it would become funny again, and then the character would still be in the foreground saying, "Okay, well, I'll go now." That sort of thing, just this misdirection kind of stuff. Stuff that absolutely would not work on screen. I think I developed an appreciation that different media can do things -- and I was applying this to comics as well, of course -- do things that other media absolutely can't do. There are certain things that a particular medium can do that can only be done there. FARAGO: Speaking of that, can you see Fred being adapted into other media? LANGRIDGE: I have been dabbling with the idea of trying to convert one of the one-page Fred strips into a one-minute animated Flash cartoon or something, just to see if I could do it. To see if it'd work. And there's a comedian in Britain called Johnny Vegas who, if there's ever a live-action version of Fred, I think would be ideal casting. He's got the same sort of piggy eyes, physique, and heartbroken demeanor. But it's not something I'm personally interested in pursuing, particulary. If people come knocking at my door and they say, "Here's a check," I'll say, "Fine," but it's not a big interest of mine to have the character appear in other media. And he wouldn't work on radio anyway because he doesn't talk. FARAGO: He seems like he'd be a perfect action figure or thing I could put on the mantel. LANGRIDGE: I've got these clay figures of the cast of Thimble Theatre that I made when I was fourteen or something. I haven't done anything like that in years, but I have seriously considered, if I ever have an afternoon free without a two-year-old running around my ankles, making a Fred figure. Even just for my own satisfaction, it'd be nice to have one of those sitting in the living room. FARAGO: The Warner Brothers, the Looney Tunes cartoons were another influence on you. LANGRIDGE: Yeah, and the Fleischers. FARAGO: So all of those, I assume, crossed the ocean? LANGRIDGE: Yeah, they were shown on TV a bit. Not so much Tex Avery. I didn't discover Tex Avery until I arrived in Britain. But certainly Chuck Jones, all the Bugs Bunny and stuff. The Fleischer stuff I didn't really discover until I saw some of it shown at film festivals and things. There was a little bit on TV, but not a lot. I suppose there's a little bit of... is it defensiveness? I don't know... about whether or not you're just dragging up a whole lot of stuff from your childhood that is without merit except for the fact that it's from your childhood. But hopefully there's a core or something, a point to pulling it out of mothballs. FARAGO: Another place that people might know your work is from the two Bizarro Comics anthologies from DC Comics. LANGRIDGE: I've had a bit of stuff in DC comics. There's Bizarro Comics, there's a couple of issues of Legends of the Dark Knight, and there's most of the Big Books. I think the Big Book of the Unexplained and maybe one or two others I wasn't in, but I was in all the rest of them. That's always... you know, somebody hands you a script and away you go. It's not something I've ever instigated myself. Oh, and there was Gross Point as well. Again, they approached me. They wanted me as an inker to begin with, and that's what I was for most of it, although I did end up penciling a couple at the end. FARAGO: I was piecing together the chronology not too long ago, and I realized the first place I must have seen your work, although I'm sure I didn't register the name, was when you were inking a Captain America backup story with Ron Frenz. LANGRIDGE: That was immediately after Gross Point finished. I think a couple of assistant editors were drunk in a bar and swapping freelancers' phone numbers. "You should try this guy, I don't know... " That might have even been before [Gross Point] was cancelled. Somebody at DC took pity on me and thought I might need some more work soon. So, yeah, that just sort of came out of the blue. I wanted to try it, to see if it was something I might be able to make a stab at as a regular source of income. After inking what was originally intended to be one issue, which they eventually split into two half-issues, I sort of realized that it wasn't really for me. But I'm glad I did it. It was fun to do. Ron Frenz is the last person who draws in the old Marvel house style, which is pretty much... once that's gone, that's when my interest in Marvel ends. LANGRIDGE: It wasn't even part of a story. I think it was just a pinup he did in the back of Bicentennial Battles that the editor or whoever was responsible for it spun into a story on a whim. LANGRIDGE: Inappropriately, I must say. They asked me to make that heavily-detailed woodcutty look, because they thought it would evoke the era, but I think it worked badly. It didn't really have the spring and punch of the Marvel house style. If I had another chance to do that, I'd probably do it differently now. FARAGO: In the Big Books, something I've always wondered as a reader is how heavily scripted they are, and if they do the panel layouts for most of these, or if you just get a script. LANGRIDGE: The panel layouts were always actually printed on the artboards. There was always this nine-panel grid in blue that you got on the artboards, when you were sent the boards. There weren't actually page breakdowns drawn on them or anything, but it was always in the script if there was to be a panel that was two panels wide or three panels wide or whatever. That was always there on the paper. So, yeah, there wasn't a lot of leeway. It was always a lot of work -- it was often an entirely new establishing shot on every panel for less than your standard page rate. And because it was black and white, you had to make more detail than you would if it was for color. Economically, not the greatest thing. But it was always more than any alternative cartoonist would get paid for anything else. And it was good exposure, and I got to work with some people I'd wanted to work with, or who I didn't know I wanted to work with, but once I had I was glad I did. So from that point of view, it was really good to do. FARAGO: That explains a lot. Looking through it now, it's a bunch of people who I know now through completely different things, people who completely dropped out of the comics scene, or people who were on the verge of leaving it or being blacklisted or shoved aside. [Roger laughs.] So that sort of explains the collection of talent in the Big Books. LANGRIDGE: A lot of the writers were people I'd never heard of as well, who came from outside comics. Which is probably no bad thing. But there were comic writers I did get to work with, people like John Wagner, who created Judge Dredd, who I'd always wanted to work with. And I got to illustrate a script by Gahan Wilson, for God's sake. How good is that? So, yeah, it was definitely an eclectic bunch. FARAGO: Bizarro Comics is another eclectic bunch of artists. How was the collaborative process on this? Was there any collaboration, or did you just get a script and go to it? LANGRIDGE: No, I just got a script. The first one was written by Alvin Schwartz, who actually created Bizarro. He'd be in his late seventies at least, possibly older. I doubt he's heard of any of us, or even bothered to read the book once it arrived. But that was a hoot. It was completely nuts. And it had all of that goofy Bizarro logic that people who've followed since Alvin Schwartz and his contemporaries left the strip... they've tried to duplicate the Bizarro logic every so often, and they just don't get it. It's really hard to do unless you are, I guess, of that era. I don't know. I don't know what the secret is, but anyway, he got it. It was terrific fun to do. They actually asked me to do it in the John Forte style of the original, which I couldn't quite pull off, but I tried to at least evoke it. FARAGO: There's something just wonderful about the character. We can't really aspire to be Superman, but we can at least maybe take some pride that we're not as horribly incompetent as Bizarro. I'm not exactly sure what the appeal is to little kids, or the adults who have latched on to him, but he's a very appealing character. LANGRIDGE: Yes, he's got a very simple thing going on. He's like Superman as an innocent kid, in a way. FARAGO: You're typically the artist when you're collaborating with people. Do you ever write for other artists? LANGRIDGE: I think the only thing I've ever written that anybody else has illustrated is a couple of pages I did for Cornelius once, just for fun. I don't think it's ever happened anywhere else. FARAGO: Do you feel protective of your own scripts? LANGRIDGE: No, not especially, it's just nobody ever asks. [Laughs] I'd be happy to do it, but I'm a lot less confident about my abilities as a writer, so I don't put myself in situations, generally, where I'm going to be judged on my writing. I know that my art can usually save my stories, to a certain extent. I consider myself an artist first and a writer second. FARAGO: If you got to walk into Marvel or DC's offices tomorrow, or any of these companies, which character or characters would you like to give a shot? LANGRIDGE: I'd kill to do Plastic Man, as well you know. Metamorpho the Element Man is one of my favorite characters, particularly the old Bob Haney and Ramona Fradon stuff. I just love the character dynamics in Metamorpho, more than the character, really. It's the supporting cast that I want to work with. The evil millionaire, and Java the Ape Boy, and all that stuff. FARAGO: I just love that there's a caveman, and a beautiful woman, and Stagg with his pointy hair and everything. Hopefully they'll get around to doing the DC Archives Metamorpho sooner rather than later. LANGRIDGE: They should. It's not like it's a huge commitment. It's one series of about sixteen issues, plus a couple of later one-shots, I think. There was a First Issue Special by Haney and Fradon, and that's about it. FARAGO: He's one of those second-tier characters, like the Metal Men, that people have this incredible affection for, and always get the short end of the stick. LANGRIDGE: I wonder if the reason people have such affection for them is because they were never mucked around with that much, at least until recent years. I don't know about you, but I've pretty much written off everything that was done after I stopped reading them. They do evoke an earlier, more innocent time, I suppose, which is part of the appeal. There's still some work to do on the script, we're still at that stage of things. And I won't actually believe it's out until I see it on the shelf. But it's fun, and from my point of view it's a way to take some direct action against what I perceive as a really depressing trend in the superhero comic field, for everything to be sort of grim and humorless and absolutely unfriendly to children. Which is as shortsighted as you can possibly get. I can either rant and rave about it on street corners and throw bottles at people, or I can actually do something about it, and this is an opportunity to do those comics the way I think they should be done. Particularly, having become a father in the last couple of years, it's something I think is important. LANGRIDGE: Killing the Elongated Man's wife, what was that all about? It's like William Powell and Myrna Loy, that's what the characters were based on. It's The Thin Man. And there's Myrna Loy lopped off. Who'd want to do that to Myrna Loy? LANGRIDGE: I've seen a bit, yeah. FARAGO: I've been reading it for years, basically because the characters age, and the oldest son is about my age, so in a bizarre way it's like keeping up with family. LANGRIDGE: That's been pretty much my attitude to superhero comics, actually -- it's sort of like keeping in touch with old school friends once in a while. Although I generally find that they're alcoholics and I don't want them hanging around. FARAGO: [Laughs] I just get the impression that, when they're off-panel, these characters are a little bit nervous, because every once in a while a grandparent will die, or someone will get in some sort of an accident and they're on crutches. I imagine that they're a bit nervous behind the scenes. [Roger laughs] And I suppose right now in DC Comics, whenever they announce there's a big series coming up, everyone who's not Superman and Batman looks around and is just a little worried about this. That's not really a question, is it? Alright... Now we can veer off into everybody's favorite part, which is the technical questions. 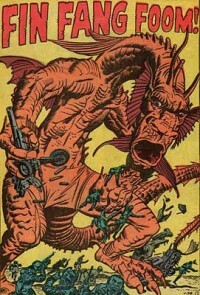 FARAGO: When did you first own a computer, and when did it start affecting your comic artwork? LANGRIDGE: We got our first computer, which was just this tiny laptop, very bare-bones kind of a thing, with a black-and-white screen, in the early to mid '90s, maybe '93 or '94, and just used it for email for a long time. Then I started to realize that my illustration career was being hampered by the fact that I didn't have a computer, because I couldn't color stuff and email it to people, and turn color artwork around in the time that was being expected of me by that point. Computers had become quite widespread by then -- this was 1999or so. So I bought an iMac after doing a bit of homework and figuring out that I'd probably need a Mac if I was going to do graphic design of any kind. Not long after that, I started to think about the whole business of doing a webstrip. That all came pretty quickly. At the time, I'd been doing mainly illustration work for a very long time. I did the odd comic thing on the side whenever I had time, but it wasn't that much and I was feeling frustrated and dissatisfied with the whole lack of comics creation in my life. So I decided to do a weekly strip, simply as a way to keep me productive. And of course once I started doing a strip every week, the technique of producing work for computer became something I explored more and more, and it became more and more second nature as well. When I started doing a webstrip, I'd been doing mainly black-and-white work -- or mainly work to be seen in black and white -- for years by then, for about a decade. That was sort of my default setting, if you like -- all this really heavy crosshatching and lots of black. Gradually, although it wasn't obvious to me when it was happening, I've reached the point where drawing for color is now my natural way of working. I really have to work hard to do work for black and white, to the point where I now feel that the next thing I do is going to have to abandon the computer completely, just so I don't lose those skills which I took years to acquire. I'm afraid of losing them, so I want to get back to basics with the next thing. FARAGO: Jason Shiga's website proudly proclaims -- because he started just doing minicomics that he photocopied, and he said things changed once he discovered the computer -- I think the exact quote is, "On the Internet, color is FREE!" And "FREE!" is in all caps. LANGRIDGE: That is a very big attraction. For the many things that the Internet has against it as far as comics are concerned, with the low resolution and what-have-you, the color is a huge boon. And the fact that you can just do whatever you like, and not pay to have it seen by as many people as possible. FARAGO: You're one of those artists, I take it, for whom the computer is just another tool in their repertoire? LANGRIDGE: It's a tool not only as an art production thing, but it's a terrific tool as a distribution thing as well. It's a great way to get seen by a completely different audience. The comic audience is pretty much the same group of people, and they have to seek your work out in a comic shop, and they're getting older and eventually they'll all be dead! Being on the Internet means you are seen by bored office workers, mainly, I think. And possibly schoolchildren. [Laughs] But anyway, it's a different audience who you wouldn't be able to reach otherwise. And hopefully that will mean that my career will have a little more longevity, once all of the print comic readers are moldering in their graves. FARAGO: Have you switched over to computer lettering? LANGRIDGE: I've done a bit of both. One of my regular paying gigs is doing the lettering on the Doctor Who comic strip, which I've been doing [on computer] for about five years now. So I'm a professional comics letterer in that respect. And I letter some of my own comics on the computer, mainly when I don't have time to do it properly. It's nice to have that to fall back on on a particularly rushed and horrible day. It's great for title lettering. I suppose that's what I mainly use it for in my own stuff. But I'm a hand letterer. I like the flexibility of hand lettering, and I like the subtle things that you can do with hand lettering that you have to spend a lot more time to do on a computer. They're not impossible to do on a computer, but you've got to work at it, whereas if you use your own handwriting it's automatic. FARAGO: I've got covers here, and hopefully wherever this runs we'll run the covers with it for reference. Are these covers hand-lettered? LANGRIDGE: The Fred the Clown logo is hand-lettered. I often get asked if that was a font, and when there have been foreign translations of it, I get asked by the publishers to send me the font, and I have to say there isn't one. I've actually had to redo the logo in different languages once or twice. FARAGO: Just changing the word "clown," or does the name "Fred" have to change? LANGRIDGE: The "Fred" doesn't, but "clown" had to be El Payaso Fred for the Spanish edition. No More Mrs. Nice Nun, I did with a font called Coop something -- Coop Bold or Coop Black. It's one of the Coops. That was mainly because of time pressures. I knew it had to look good, and I knew I didn't have time to do it properly. So I did it with a font, and it looked fine. It's a good font -- it looks like it's hand-drawn in the first place. In fact, it looks more hand-drawn than the Fred the Clown lettering does, which was hand-drawn. FARAGO: And the coloring is all done on the computer now? LANGRIDGE: Yeah. I used to do a lot of painting, and the computer just speeds the whole thing up exponentially. To do painted page took me anything from four days to a week, and that's just for one page. There's no way I can sustain that for a weekly strip. The computer has been a great economic boon in that sense. I can produce color work that much faster, and get paid for color work, which is always nice. It's always more than black and white. FARAGO: And you're the designer of the covers? LANGRIDGE: Pretty much. The blurb on the back I had nothing to do with. FARAGO: With the misspelling [of "Monty Python"]. LANGRIDGE: With the misspelling, yes. But I did leave room for that. There's this odd bit of white space on the Fred the Clown flaps, because I didn't think to ask what the dimensions of the flaps were. I assumed that they would fit the dimensions to what I drew, rather than me having to fit what I drew to their dimensions. That's why it worked out that way. But apart from that, I'm really pleased with the way the book came out. FARAGO: Have you ever sought design work as a supplement to your income? LANGRIDGE: I wouldn't know where to start, actually. I think my range of skills... I mean, I design comic stuff because I can afford my own labor, and that's the only reason. I don't know anything about graphic design. There are a lot of skills that I would need, I think, that I simply don't know about, never mind know whether I can do or not. I simply don't know whether they exist or not. LANGRIDGE: Yes, I use magic paper. Magic paper that made my life so much easier. Just leave the brush on the paper, come back when I woke up, and the elves have done it. Actually, this will sound nutty, but I get this stuff from New Zealand called Zeta Mattpost paper which I can't get in the UK, and I spray-mount it onto card and I work on that. I haven't found any paper in the UK that I like working on -- even the paper actually called Zeta Mattpost here is totally different to work on. FARAGO: I know Charles Schulz, for example, found one particular type of pen nib that he liked, and when he found out it was going out of production... they went and bought it by the caseload. I think he bought out absolutely every last one on Earth that they could find, so that, in the event that he lived to be 100 or 300 years old, he would never run out of these particular pen nibs. Is there a brand loyalty or anything? LANGRIDGE: Pretty much anything that makes a black mark on paper is fair game. I don't use felt tips a hell of a lot, but I'm not pathologically opposed to them, and when it's called for, for speed or whatever, I will go to the dark side. But generally speaking, I do all of my figure work with a brush. I've tried several brushes over the years, but I don't think I should recommend any particular brand of brush. You've got to find what works for you, and I've switched allegiances so often that it would be probably out of date by the time anybody reads this. So, yeah, generally a #2 brush for the figure work. I was doing all the background detail and what-have-you with Rotring pens for a long time, and I've started using a Hunt 102 dip pen recently for a lot of that stuff. And indeed for a lot of the figure work -- I'm just sort of experimenting a little at the moment. But I've always found, when I've tried different tools, I've always gone back to the brush. I expect that's what's going to happen this time as well. FARAGO: What's your studio situation like? LANGRIDGE: We had a spare room -- we no longer have a spare room, we have a studio. Which is, not to put too fine a point on it, a chaotic mess. I've got a drawing board at one end, a computer in the middle of the room, a big stack of comics all over the room, on shelves, in cupboards, tottering in stacks, in boxes. That's pretty much where I do everything. I sometimes bring some work downstairs to plunk down in front of the TV of an evening, but basically I do everything in this room. FARAGO: Do you listen to music, do you have a crying baby running loose in the room, or are an absolute-silence sort of guy? LANGRIDGE: Once I've got the bare bones of what I want to do, if I'm just working out rhythms or whatever, I can listen to some music that doesn't have any lyrics in it. I can listen to instrumental music, Bill Frisell jazz kind of stuff. For penciling, again, I can listen to instrumental music. I don't listen to anything with lyrics unless I'm doing something completely brainless like inking or coloring. Then it's sometimes music, sometimes comedy. I listen to a huge amount of comedy. Or Radio Four, which is comedy and drama and current affairs and all that sort of stuff. I'm out of touch with modern music, pretty much, so it tends to be stuff that's at least ten years old when I listen to music. Or the odd thing that crosses my radar because somebody recommended it. FARAGO: That reminds me of another question. What's the typical social life of a married-with-young-child cartoonist? "Cartoonist" is typically a very isolated sort of profession in the first place. LANGRIDGE: Well, I don't get out much. We have friends who come to visit us, mainly. We tend to try and have people round for dinner as often as we can, which tends to be one or two times a month if we're lucky, maybe less if we're not. I don't see a lot of my colleagues, or even my friends, very much. Fortunately, in the days of email, we have mailing lists and we email one another and that's all right. We're not completely cut off from the real world. Well, yes we happen to be cut off from the real world, but cartoonists don't count as the real world. I've started to ramble now. So, yeah, don't see as much of the human race as I used to. But I never used to see that much, so it's not that big a wrench. FARAGO: So it's you and your wife Sylvie and Tamsin, the little one. FARAGO: How did you and Sylvie meet? Any courtship that's suitable for public consumption? LANGRIDGE: It goes back to what something I said earlier in the interview. In 1991 I went back to New Zealand, thinking that I could work long-distance with publishers in Britain. That didn't work out. So in 1992 I decided to go over to Britain again for a few weeks, knock on a whole lot of doors, go to a comic convention, grab people by the throat and say, "Give me work," and then come back and do whatever I'd managed to get out of the trip. I'd arranged to stay with a former flatmate of mine who lived in Britain -- who lived in London, in fact. I showed up and tried to get hold of him. He wasn't at the airport, he wasn't at the end of his telephone, I didn't know where the hell he was. (I eventually discovered that he'd joined the army!) So I started to phone people that I knew, saying, "The place that I arranged to stay doesn't seem to be working out, I can't find the guy, do you have a sofa?" I was working my way down the list until I was getting to people who friends back in New Zealand had said, "Oh, you must look this person up," who I had no intention of looking up. I was actually phoning these people and saying, "Do you have a sofa that I can sleep on for three weeks?" Fortunately, one of them said yes, somebody I'd never met. His name was Richard Bird, and we're still friends. Sylvie was sharing a flat with him at the time, along with a few other people. That was the first time I met Sylvie. The first words she ever said to me, seeing this bedraggled figure with a suitcase sitting in her kitchen and realizing that I was going to be around for dinner, was, "Chocolate mousse?" Those were the first words. She was seeing somebody else at the time, and I was going back to New Zealand, so nothing happened then. I came back to London a year later for good, after my second stab at working from New Zealand hadn't worked out. After a few months, there was a vacancy in the flat that Richard and Sylvie and these other people were living in, so I ended up moving in and becoming the fifth flatmate. Another year later -- this moved rather slowly -- we sort of finally got together. And we still are. Must be... almost eleven years later now. FARAGO: So it's just like your EastEnders or Coronation Street, where season by season you're shaking things up. LANGRIDGE: Yeah... there's actually more to the story than that, but some of it's probably best saved for another occasion. It'll be interminably long otherwise. FARAGO: I'd like to thank you for your time. I've kept you away from your family long enough. LANGRIDGE: Thanks for letting an old man whitter on endlessly. Editor's Note: Since this interview was conducted, DC Comics has announced a cheap edition of their Metamorpho material in the "Showcase" series, and Roger himself has announced an Art d'Ecco collection for September '06.